It’s time to bid farewell to our Golf. After six months and nearly 7,500 miles with us, it’s certainly been an easy car to get on with, but not one that’s particularly tugged at our heartstrings. For this member of the Parkers team at least, our Web Producer has always found the driving experience of a Ford Focus a more exciting prospect, but after spending some time living with a Golf they can understand why it’s a five-star car - it appreciably ticks more of the right boxes than its rivals with its smart looks, great build quality, nice attention to detail, good range of engines, easy-to-use controls and decent level of refinement. 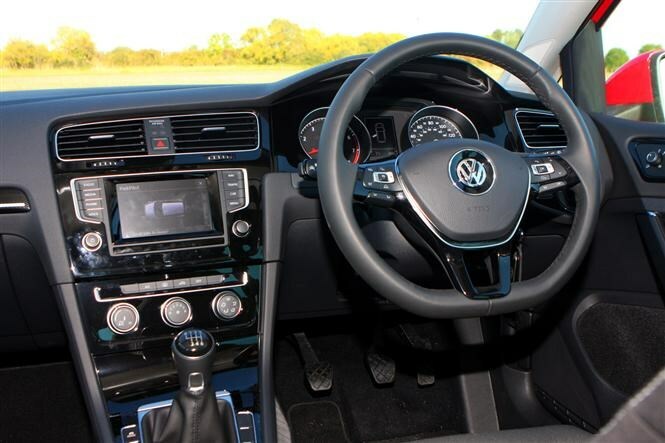 As a no-nonsense car that gets you from A-to-B with minimal fuss, there’s very little to fault about our Golf and this dependable VW with its well-built, rattle-free interior pays dividends if you hanker after a relaxing environment to spend hours on the road in. What’s even better is that the Golf is as good to drive as ever before, nearing close enough to the Focus that I’d reconsider my default recommendation for a mid-sized hatchback next time. My fondest memory of this car though is the 1.4-litre 150hp engine. It’s smooth, revs cleanly, makes a nice note below 4,500rpm, and with cylinder deactivation fitted, offers appreciable fuel-efficiency on longer journeys. Unfortunately, the biggest problem with our long-termer is the price. It’s uncomfortably close to £25,000 (£24,270 to be exact), and while some may appreciate the understated looks, it feels as though the premium spent over a similarly-spec'd Match model goes solely on that wonderful engine. All in all, it’s fair to say I haven’t completely gelled with the Golf. It hasn't captured my need for entertainment on the road and the technological safety features have failed to convince, but it is difficult not to recommend it as a car that simply works well straight out of the box. In some sense it's a bit like home-cooked food: dependable, reliable, not the most exciting - but it’s what you’ll want for a dose of comfort. The Golf has proven an easy car to get on with in the Parkers team, but here’s a first-world problem that’s continued to bug me from day one: mobile connectivity. Why VW decided to make its own universal port over the already-universal USB is beyond us. The Golf initially arrived without the required cables too, leaving us stuck with Bluetooth and the absence of phone/iPod charging in the process. When they did eventually arrive, they came as a set of three: catering for the two types of Apple connectors and a standard-sized USB. Naturally, with all of us using different devices of various makes and ages, the first faff to deal with whenever we get back into the car is to switch to our preferred cable. Sounds easy enough right? 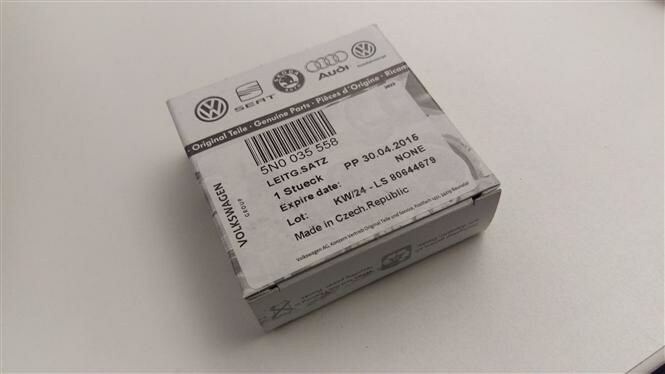 Well, with the port located in the dash cubby hole with the release clip facing the wrong way, you’re usually spending the first part of your journey simultaneously cursing, ignoring confused passers-by and wondering if VW employees have particularly tiny hands. You could simply leave the USB socket attachment permanently plugged in and bring your own cable, but that leaves you with a reel trailing around the gearlever. The solution so far? Don’t lend the car out. Android and iPhone Lightning users can walk. Given the recent decrease in petrol prices, coupled with the downsizing of larger engines to smaller turbocharged units, it’s been interesting to see petrol power become an attractive financial option again. 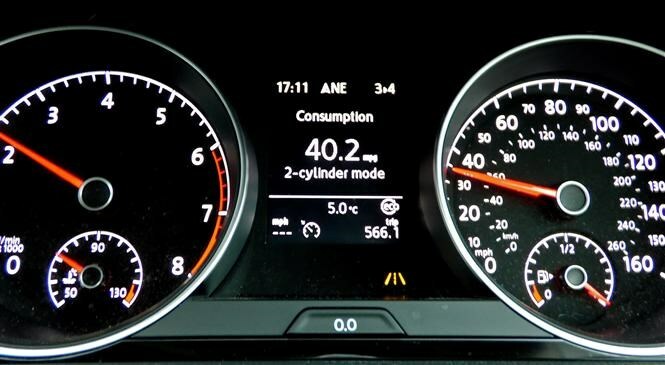 Despite diesel engines appealing as the default option for high-mileage drivers, in some respects petrol remains the cleaner choice, as well as being cheaper to buy in the first place. Thanks to a turbocharger, the 1.4-litre engine in our Golf produces roughly the same power you’d find in an old-fashioned 2-litre, but with features such as stop/start and cylinder-deactivation, VW claims an average fuel consumption of 58.9mpg. In reality though, we can’t help but feel slightly disappointed with the mid-thirties mpg figure we’ve been getting so far. The tyre pressure monitor decided to beep for the first time with a warning at 32psi. 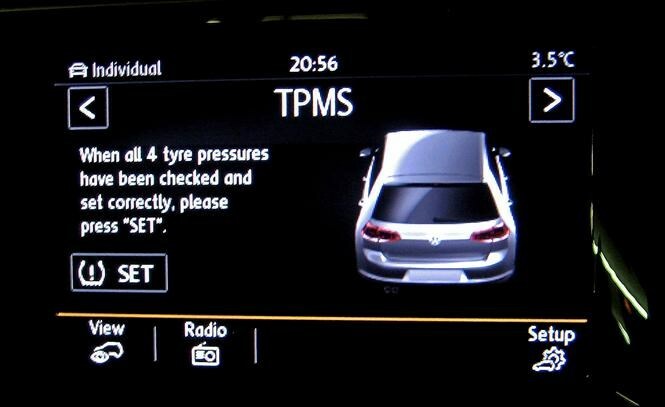 A look at the tyre pressure chart on the door panel recommended 35psi for greater ride ‘comfort’, and 39psi if not. That’s quite high in my books, and even the neighbouring BMW owner was surprised given his run-flat tyres were lower. Still, with tyres pumped up to 39psi and a 180-mile return journey to London on the motorway, the VW managed to return a more respectable 42.59mpg with three people on board. Unsurprisngly, the cosseting ride quality had disintegrated along with a slight decline in cornering grip levels, but that’s quite a leap from my average figures so far, though still not quite a match for Gareth’s previously. Despite this being considerably down from the combined official 58.9mpg, it’s a vast improvement that's welcome nonetheless. Is a 2-litre diesel GT still the default choice? The diesel will still be the default choice for high-mileage business users thanks to cheaper fuel and tax costs, but for private buyers the petrol may be cheaper to run per month. Using our Parkers Cost of Motoring tool, our petrol variant would cost almost six pounds a month less than the diesel option over three years and 30,000 miles, all thanks to cheaper servicing, lower depreciation and a £500 lower retail price. Our 1.4-litre TSI engine in some respects hasn’t returned any spectacular mpg figures, but for an engine that peforms as well as the 2-litre it technically replaces, this is a marked improvement. 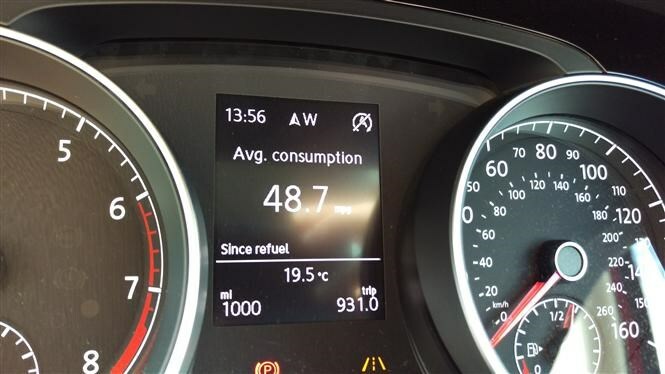 Even with their electronic assistance, a quick peruse on forums has also found Golf GTE owners only being able to just reach past the 40mpg mark too, and since that's essentially a £34,000 car, we'll count this a small victory for us. So, you can’t quite have your cake and eat it yet with petrol engines yet, but you can certainly have more than what you used to. We've been experimenting with the Golf's ace card lately. Deactivating cylinders is typically reserved for larger and more exotic engines – think Bentley or Chevrolet with their muscular V8s and you'd be about right, but this technology has made its way down into our humdrum, mass-produced, four-cylinder Golf. 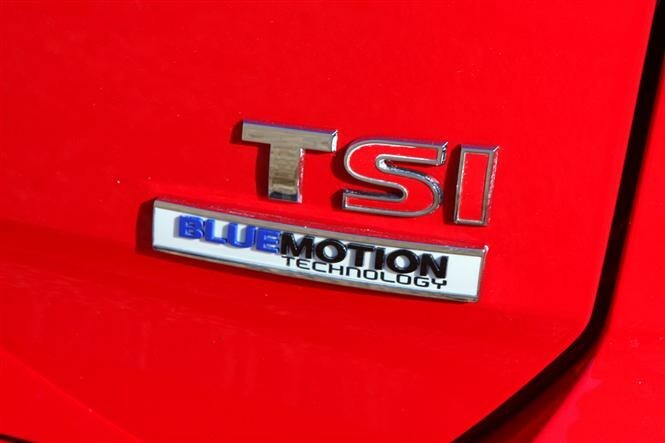 With the system fitted to our 1.4-litre TSi ACT unit in the Golf (the 'ACT' part standing for Active Cylinder Technology), two of the engine’s four cylinders are deactivated when cruising at light loads between 1,000rpm and 4,000rpm. It works at speeds up to 80mph in any gear, with VW quoting CO2 emissions reducing by as much as 9g/km, dropping fuel consumption in the process. Thanks to a highly-sensitive throttle sensor, the engine reverts back to four cylinders again at the faintest requirement of additional power. Can you tell it’s working? 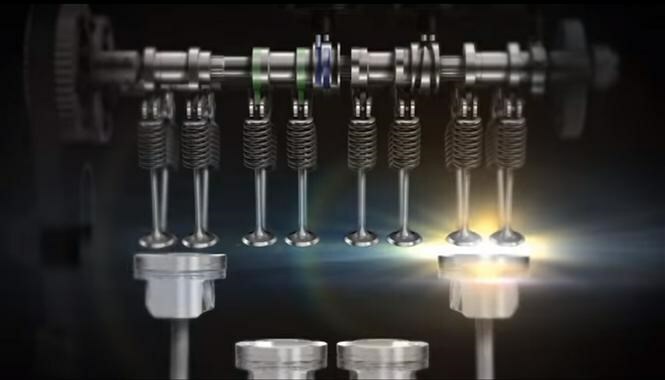 Considering the two ‘inactive’ cylinders never physically stop moving (they’re just deprived of fuel and ignition), the transition between two and four cylinders is barely noticeable; the system puts the middle two cylinders down to snooze and wakes them back up again in a smooth fashion. 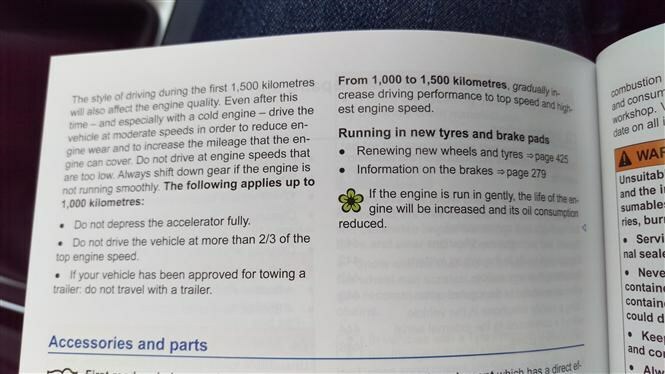 The easiest way to tell when this happens is via the small, round ‘eco’ logo that pops up on the instrument panel, but it will tell you in layman’s terms too if you’re viewing the ‘Driving data’ section on the trip computer. We're glad to say the system works seamlessly, dispelling any fears of driving an engine that would choke and splutter especially at your time of need. Happily, we’ve only caught the system out once, with just a slight hiccup from the engine after prodding the accelerator pedal around 2,500rpm in fourth gear. Cruising in general at low rpm is mostly impressive too; it appears to be more noticeable for back-seat passengers, but you’d have to listen carefully up front for the extra vibration and boom generated in two-cylinder mode. If you hover towards 3000rpm though, the discernible difference in sound is more like the equivalent of switching on the dishwasher at home, with a low-end rumble breaking the smoother, four-cylinder refinement. Unfortunately, once you do notice it, the harder it is to ignore the system working away in the background. So in terms of noise, vibration and fuel efficiency, less is indeed more….slightly. But every little helps. Switching down to two cylinders isn’t a game-changing system which results in high, diesel-like mpg figures - we're averaging a disappointing 37mpg - but it is great to see how soon the average mpg numbers start creeping up part-way into the journey. It's a worthwhile compromise in refinement which makes an economy run feel that more attainable. 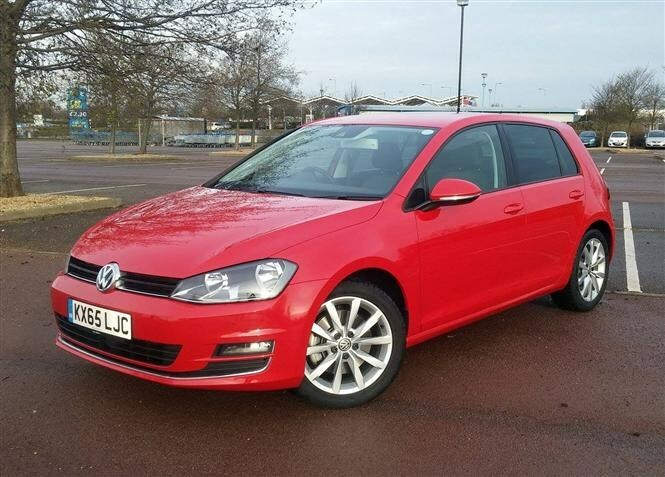 With a trip to London lined up at the weekend, I thought it would be the perfect opportunity to test my first long-distance journey in the Golf. If I can tackle London traffic in it without becoming too flustered, this would be a solid victory for the VW. Things were off to a shaky start. It’s good that you can choose to switch the keyboard layout from ABC to QWERTY (Press Menu > Setup > Keypad), but it soon loses ground when you discover there’s no option to just enter the postcode for your destination. The proximity sensor for the screen is a great feature though, and automatically hides/displays the menu icons along the bottom accordingly to maximise the map on display. Once you’ve entered the destination, the nav can offer up to three calculated route choices: fast, eco and short. However even though we selected the fastest route into London using the A1, the voice command decided to tell us to drive down a different road to that shown on the map. Common sense prevailed and we stuck with the A1 as shown on the screen, but if the voice commands don’t coincide with the line on the map, I can imagine this being quite frustrating for some drivers. 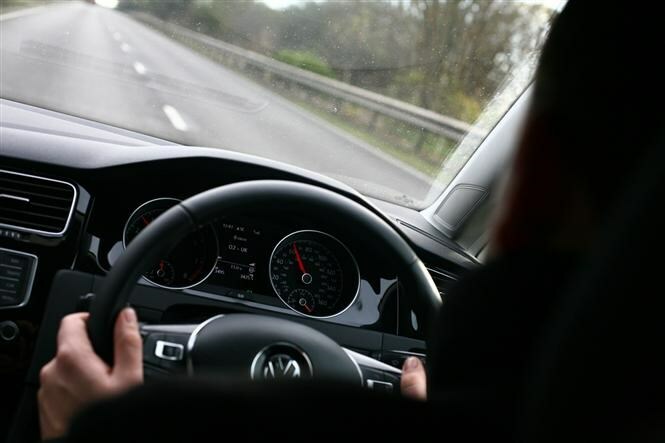 The sat-nav doesn’t dim the music during voice commands, resulting in them clashing with the radio and making the instructions difficult to hear. I would also like to know what “half-left” or “half-right” means to a normal person as a voice command? 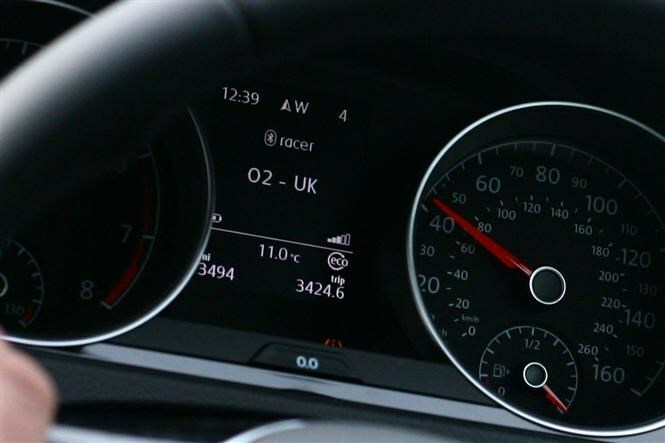 The standard sat-nav system fitted onto our GT trim was optional on GTD, GTI and R models at the time of sale (it's since been made standard on GTD and GTI models for 2016). It’s by no means the worst system fitted to a vehicle, but it further proves that aftermarket systems are ahead of the game. I can safely say the traffic reports function has been useful, but a bit of research has shown that some owners who didn’t opt for the navigation system manage with Google maps on their smartphone, streaming the voice commands through the stereo via Bluetooth, while plugging it into the USB to charge. 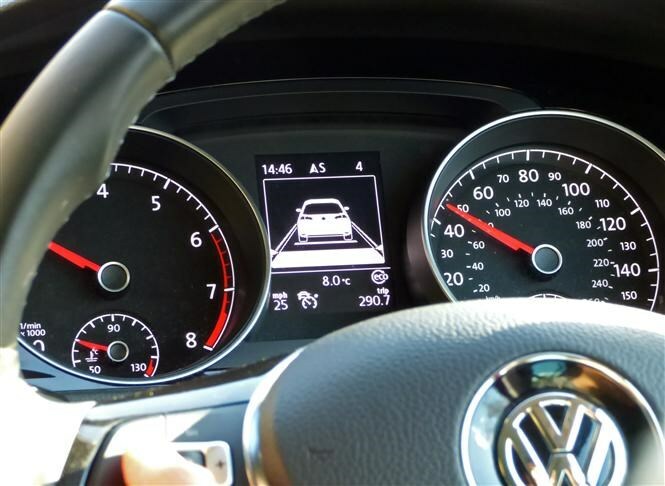 Standard on GT, GTD, GTI and R models, Volkswagen's adaptive cruise control system uses the front-mounted radar sensor to monitor the distance between you and the car ahead. The system will adjust your speed and distance accordingly and can apply the brakes if need be. The Set and Res (resume) buttons double up to increase or decrease the set speed by 1mph, while the horizontally-placed + and – buttons work in 5mph increments. It’s not been a fool-proof system, finding that it can be either too sensitive with cars far ahead in the distance, or too slow in response resulting in the system slamming on the brakes far too late when approaching a much slower car. It might take more time to get used to, but I’m finding that you have to cater for the system itself, rather than it working with you on the motorway. It’s great that the system modulates the braking for you while you check your surroundings for a lane change, but it’s been more of a hindrance having to work around the system’s inconsistent reactions rather than the potential hazard looming towards you. 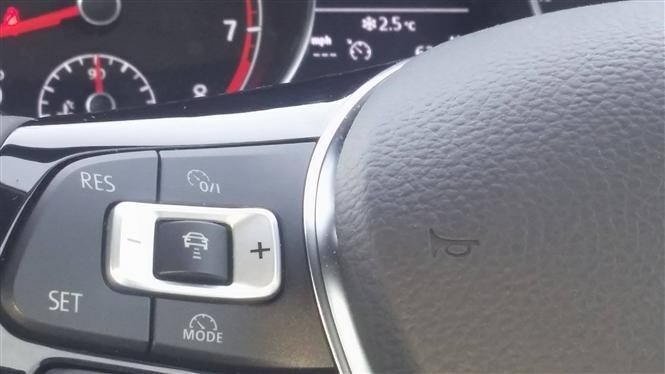 Annoyingly there’s no way of using it as a traditional cruise control with just a set speed, and so it’s best to use the system when road traffic is quieter. 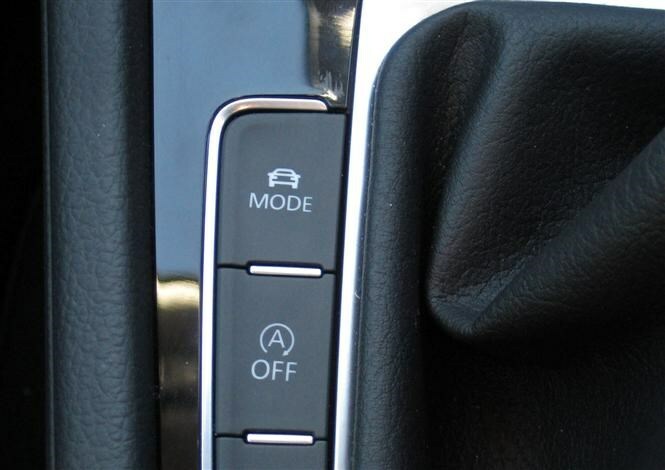 The other cruise control mode available is a speed limiter which still requires the driver to press the throttle pedal. The Lane Assist system subtly adjusts the steering angle for you throughout your journey. Thanks to a camera built into the driver’s rear-view mirror, the system can detect lane markings from 40mph upwards. It did feel slightly disconcerting at first as the front wheels felt as though they were tramlining on the motorway, but it has noticeably taken the edge off the strain on longer journeys. It is worth turning off the system during drives on country roads however, when it can act like an over-sensitive ESP system. 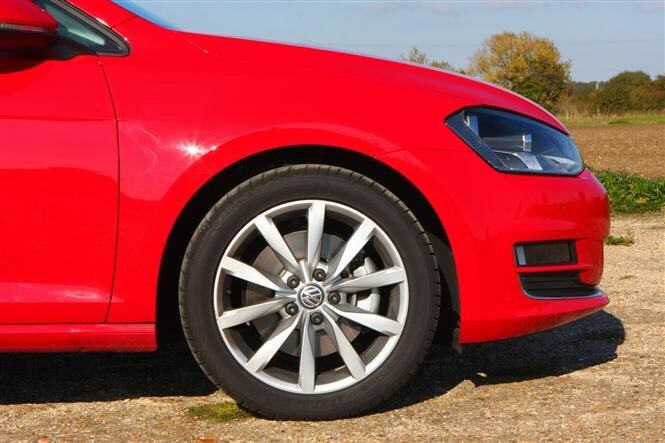 All in all, our VW Golf has been a relaxing companion to take on long journeys. The ride is cosseting, all the controls are light to use, and engine noise is well isolated from the cabin. The only slight disappointment is the level of road noise filtering through considering we don’t have particularly low-profile tyres fitted. The seats are firm and supportive, but fundamentally the seating position doesn’t quite fit my awkward body proportions – either the steering doesn’t reach out far enough or the pedals are not set far deep enough into the footwell - and so my legs are either bunched up, or I sit with the steering wheel too far away. Overall, the Golf covers the basics well, I'm just not yet convinced if the technology is adding to the experience. Eighth Report: What's your mode? 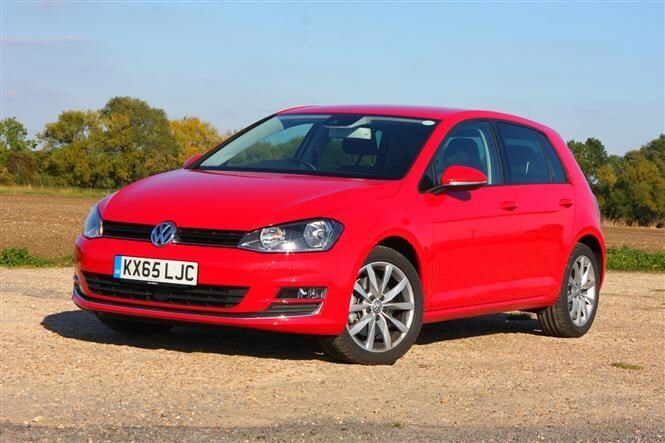 As the resident newbie in the Parkers team, I’ve been handed the keys to the VW Golf as my first long-termer — a car with a five-star Parkers rating and one that’s long been the benchmark in the family hatchback sector. The trouble is, for a car so highly coveted, I’m finding it leaves me a little unexcited. Usually I’d expect a five-star car to be expensive, excitable and exotic, but a Golf hatchback? We’ll have to see. I know the 1.4-litre TSI engine is a cracker but it’s currently too soon to tell how far the Golf’s qualities will get beneath the surface. 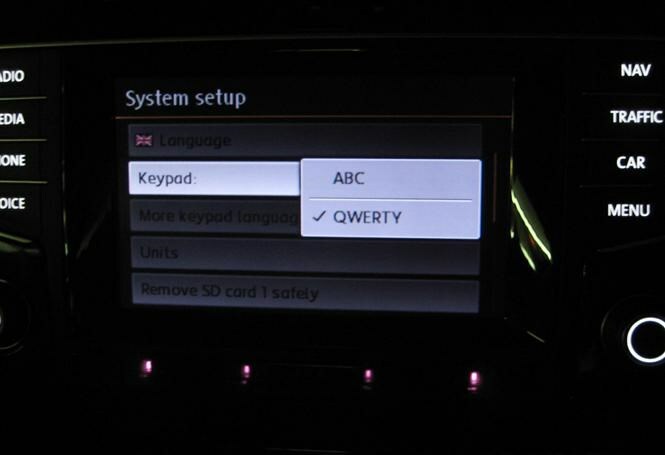 For now though, I’ve been looking to see what new or innovative features have made their way into cars of this class. 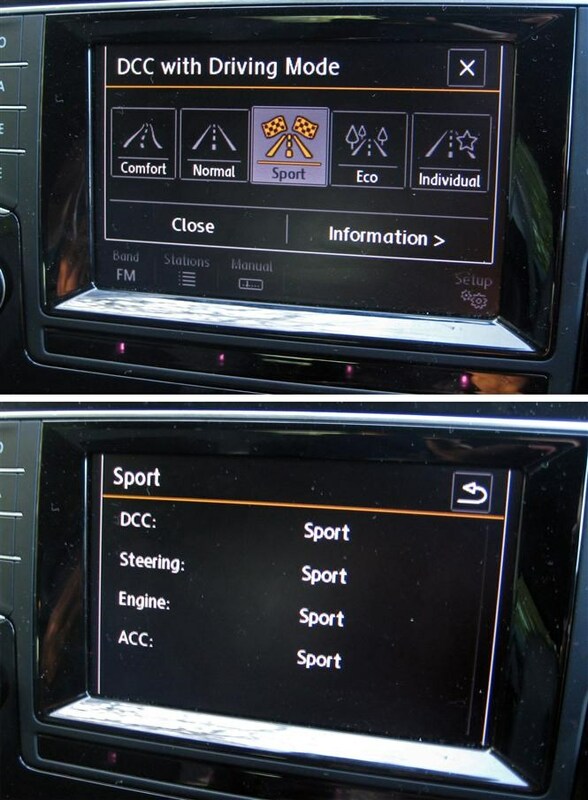 The main feature to catch my attention in the Golf so far is the "Driving Mode" selector, as I’ve not run a car with a range of on-road settings before. 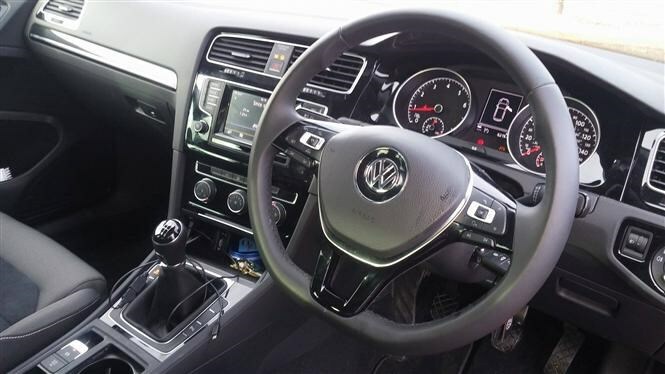 It enables the driver to select a range of options which alter the Golf’s steering, throttle response and air-condtioning. For those fitted with the optional Dynamic Chassis Control (or DCC) like we have here, this goes one further and alters the suspension stiffness too. With this you can choose between five modes: Comfort, Normal, Sport, Eco and Individual. 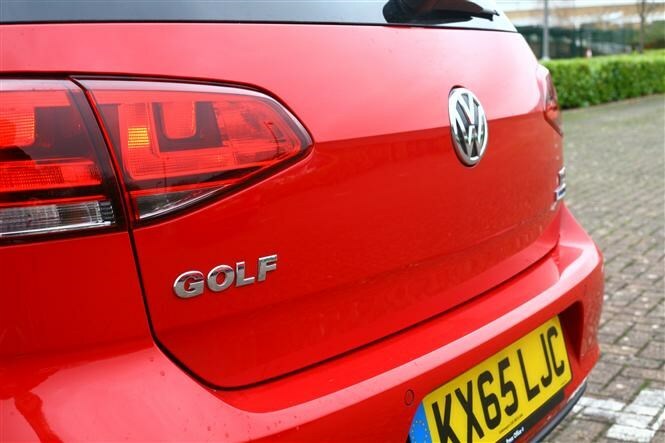 How much more can this Golf offer beyond the typical ‘Sport’ button? 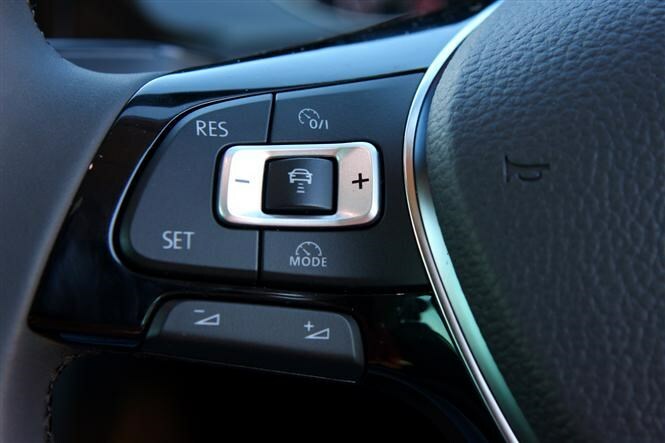 The ‘Mode’ button itself that calls up the options is actually obscured most of the time, sitting to the left of the gearlever — a design that obviously had left-hand drive vehicles in mind. You then select which mode by touching the desired option on the centre touchscreen. Comfort mode is designed for longer journeys, giving the Golf its softest ride, with lighter steering and a slushy throttle response. 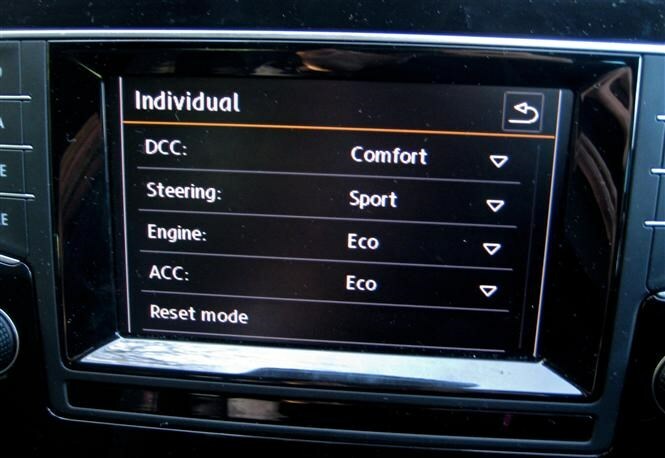 Normal mode leaves the Golf in a default setting, tuned to be a balance of all the settings for everyday use. Sport mode firms up the suspension, increases the weight of the steering and slightly sharpens up the throttle response. 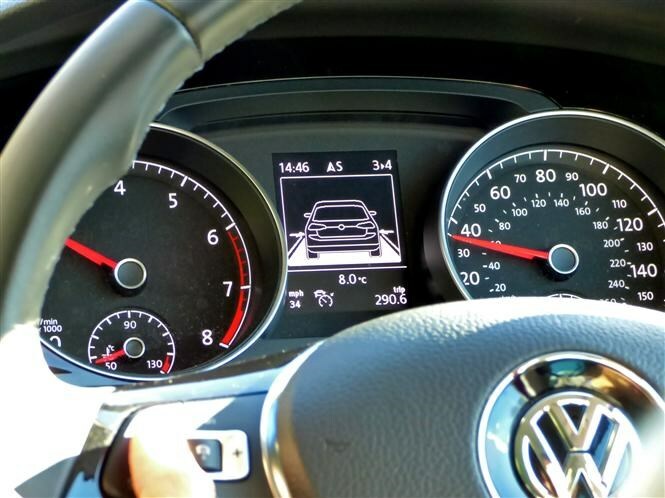 The adaptive cruise control accelerates and decelerates more quickly too. Eco mode keeps the suspension and steering settings as normal, but turns the throttle response and air-conditioning down to try and save as much fuel as possible. 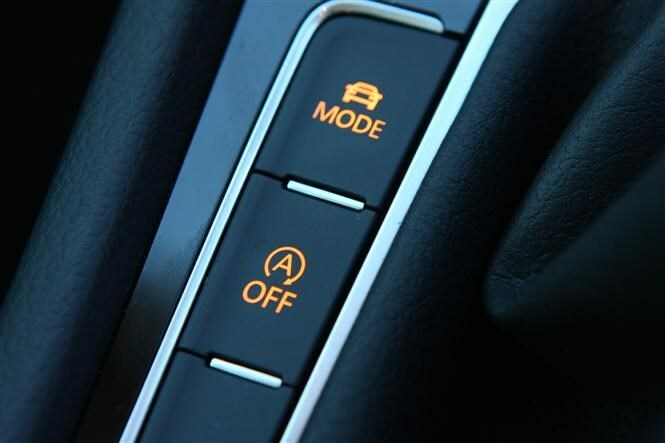 Here, the adaptive cruise control will accelerate and decelerate in a more sedate fashion. Individual lets you tailor all the parameters to your personal preference. For the moment, it’s currently known as ‘Gareth Mode’. If you incrementally work your way through the modes from the left to the right of the screen, you’d be hard pushed to notice much difference. If you jump from Comfort to Sport however, there’ll be more of a discernible contrast in the ride quality and steering weighting. 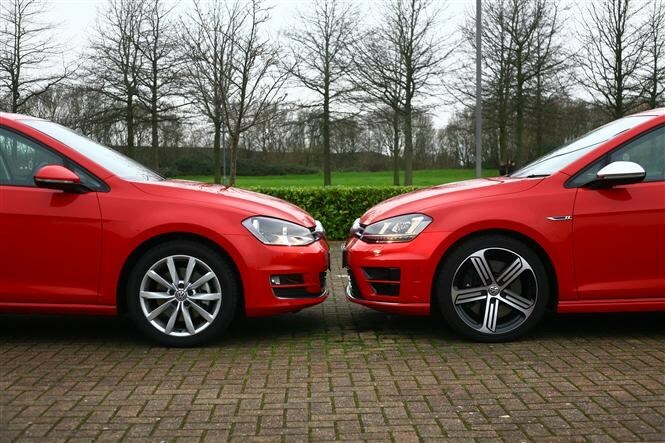 Does Sport mode transform the Golf into a hot-hatch? No. Not even close. 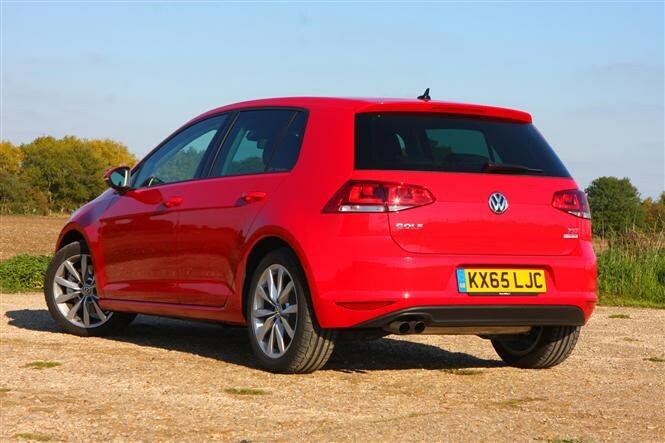 But it makes the Golf’s already well-resolved chassis feel that bit more composed and involving through twisting roads. It’s also nice to know that the ride quality in Sport mode doesn’t disintegrate along with your spine. I just default to Sport mode. I’ve found the Golf left in its softest Comfort mode numerous times after lending it out, but to me, the ride is good enough in Sport as it is. Over the festive period, all the press fleets were depleted of vans which resulted in me having to borrow Gareth’s long-termer, the Volkswagen Golf GT 1.4TSi Bluemotion. Being the van journalist, I’m not accustomed to such high levels of luxury or creature comforts, which made my commute to my native Lancashire all the more comfortable. I managed to clock up more than 1,000 miles over the two week Christmas break, toing and froing up the M6. In my usual ‘class’ of vehicle, a van, this would have been an arduous task and most certainly led to me face-planting in my mother’s Christmas dinner through exhaustion. Thankfully though, Gareth’s Golf was just the ticket, with a specification list longer than the Dead Sea Scrolls. At least, it seemed that way for a man accustomed to a box on wheels. Although they’re about to make a resurgence, petrol engines have been all but wiped out of the commercial vehicle industry, which made me all the more intrigued to test it out. 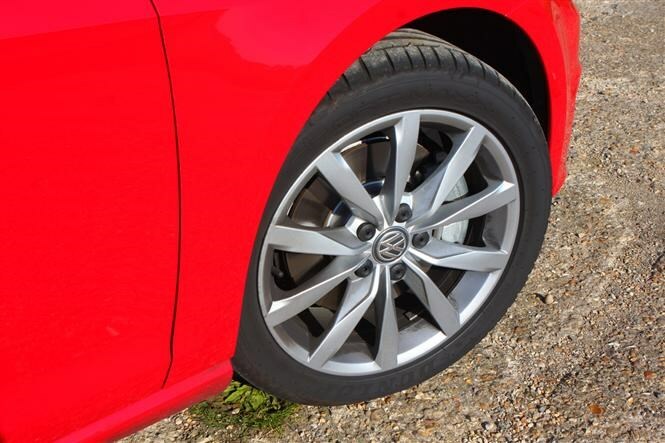 With most vans on test, I climb ‘up’ and into the cab, so it was perplexing having to crouch down and awkwardly manoeuvre into the Golf which really highlights how low-sitting the Golf is – or perhaps how old I'm getting. Once in the driver’s seat, I got a sense of how much more advanced cars are than their commercial vehicle equivalents. 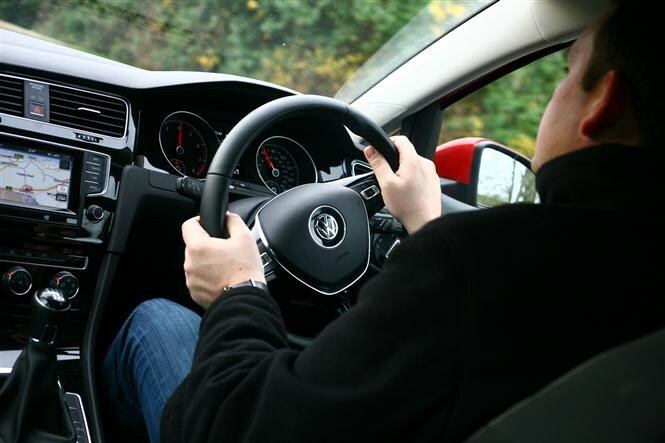 There was Lane Keeping Assist, which steers you back when the car senses it is deviating out of a motorway lane unintentionally, and Adaptive Cruise Control, which keeps the vehicle at a set speed until a slower vehicle is approached. Both these functions had their limitations during periods of thick January snow, however, when a message would pop up in the instrument panel informing me that the Lane Assist and Adaptive Cruise Control was no longer working due to the sensors not being able to ‘see’. But it was the cold weather that highlighted some of the Golf’s other features - the air-conditioning was a lot faster and more effective than most others. 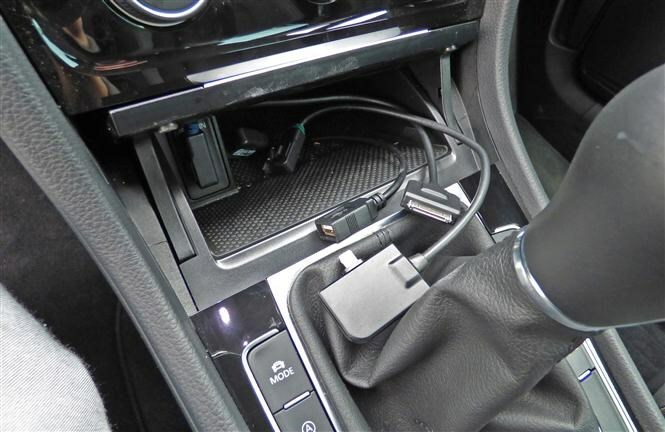 A common complaint with modern Volkswagens is the absence of USB ports, and our test vehicle suffered from the too. Instead, there is a ‘universal port’ provided with leads to fit different devices (Apple, Android, standard USB) but these can easily be lost and I can’t understand why the firm has chosen this option. Before I drove the vehicle, I assumed a 1.4-litre petrol would be fairly gutless in a vehicle of this size, but I was soon to be proved wrong. 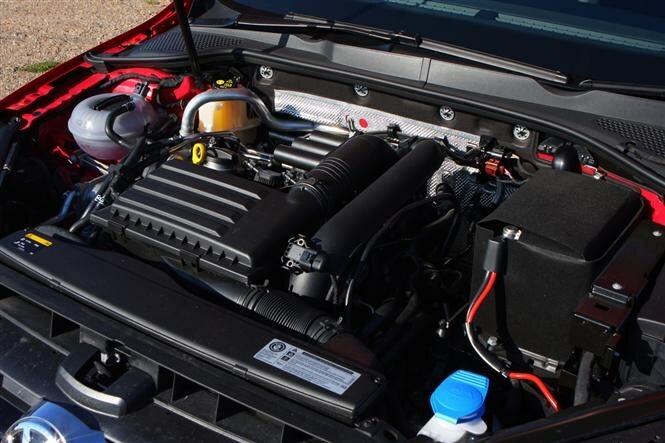 The quiet little VW engine has a wide power band, which peaks at 150hp, and has a 0-62mph time of just 8.2 seconds. The suspension is firm, resulting in minimal body roll and means, combined with the low centre of gravity, it can take corners at speed. The steering is fairly light in normal mode but heavier in sport and always accurate, while engine and road noise is minimal. Overall, I really enjoyed spending the Christmas break with the Golf. The added safety and comfort features meant the long motorway commutes back ‘Up North’ didn’t seem such a chore, while the back country roads were more enjoyable thanks to the impeccable road manners and spritely 150hp 1.4-litre engine. It’s natural to feel envious of friends or siblings at some point in your life. Tommy’s Dad was a pilot. Dave’s job takes him to Barbados every six months. It’s never much fun, and our Golf must be feeling the same. The problem is, we’ve had a car in the Parkers office this week which answers nearly every question you could ever ask. It’s the Golf R Estate, and it’s brilliant. We reckon it’s a barely believable cocktail of practicality, performance, handling, comfort and reasonable running costs. Our poor 1.4 GT must be feeling unloved. But how do the two really stack up? 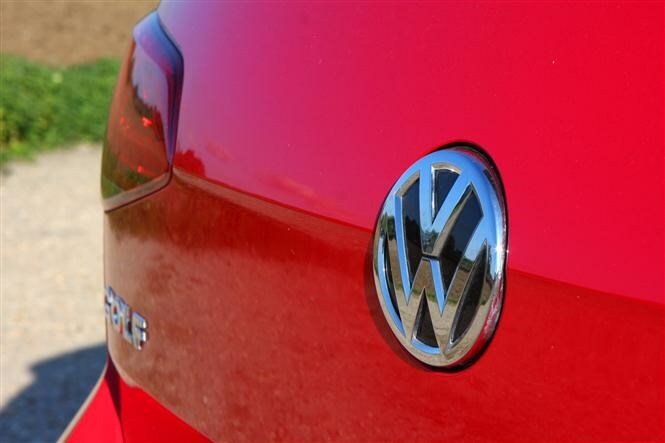 The R is one of the best-handling cars in the VW stable. Its fifth-generation Haldex four-wheel drive system shuffles power between front and rear axles almost instantly, and the chassis has been tuned for sporty handling meaning it’s a rewarding car for enthusiasts. 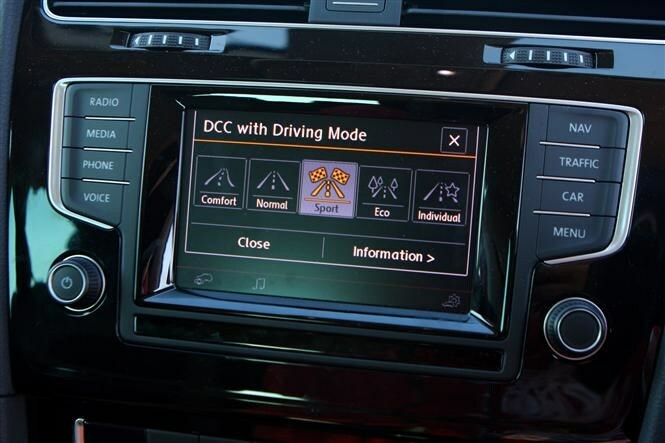 While our Golf GT doesn’t have an all-wheel drive system to speak of, it does have XDS, which is an electronic system that controls the power sent to each front wheel. That means it’s nearly impossible to overwhelm the chassis by going too fast into corners, preventing the front washing wide. Both engines are petrol-powered and turbocharged, but as you’d expect from a performance model with more than twice the power of our trusty hatchback, the R Estate absolutely tramples all over it in a dash from 0-62mph – 8.2 seconds feels a lot slower than 5.1. We love the six-speed manual gearbox in our 1.4 TSI, but just as impressive is the rapidly shifting six-speed DSG automatic gearbox in the R. You can’t buy a manual R Estate, so it’s not a choice as such, but makes a decent comparison all the same. We felt more involved driving a manual car, even if the R’s talents made the rest of the car the more engaging of the two. These cars are nearly identical in the practicality stakes except for the obvious fact that the Golf R Estate is… an estate. That means it gets a 605-litre boot compared with our hatchback’s 380 litres. Fold the rear seats flat and luggage capacity expands to 1,620 litres and 1,270 litres respectively. It’s a resounding win for the R here, unsurprisingly. Here’s where our hatchback will begin to pull things back. To start with, its list price of £23,850 is clearly favourable to the £33,585 the R Estate starts at. Saving £10,000 is never going to be a bad thing. But actually, we’d choose some aspects of this particular R over our hatchback. 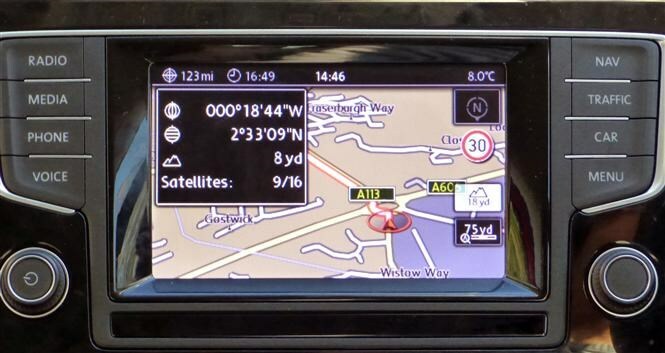 The sat-nav system, for example, is an optional £2,090 Discover Navigation Pro unit and it seems to fire up and flick through its menus far quicker than the standard Golf GT item and includes a larger eight-inch touchscreen, DVD player and a 64GB memory. Both cars have a £170 rear-view camera installed, and as you can see from the previous update, I think this is an incredibly useful feature. In terms of running costs, our hatchback’s claimed 52.3mpg fuel economy and 123g/km of CO2 output compare favourably to the R’s 40.4mpg and 162g/km respectively, but considering the performance difference we’re faced with here, it isn’t all that much of a gulf. 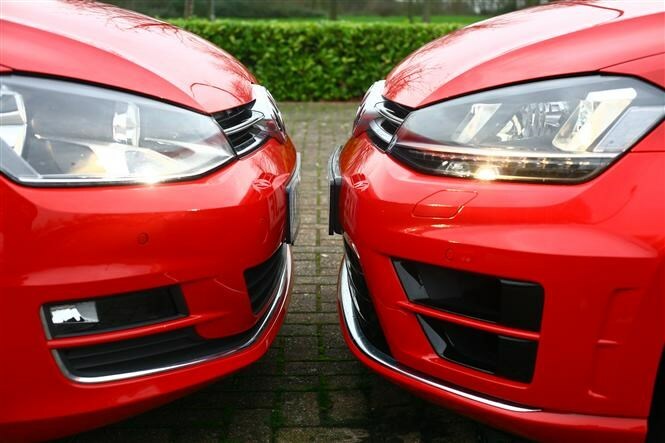 Road tax is the biggest visible penalty, with £110 per year for the 1.4 playing £180 for the R.
In truth these Golfs are aimed at different buyers, but it’s always a good exercise to delve into the differences. 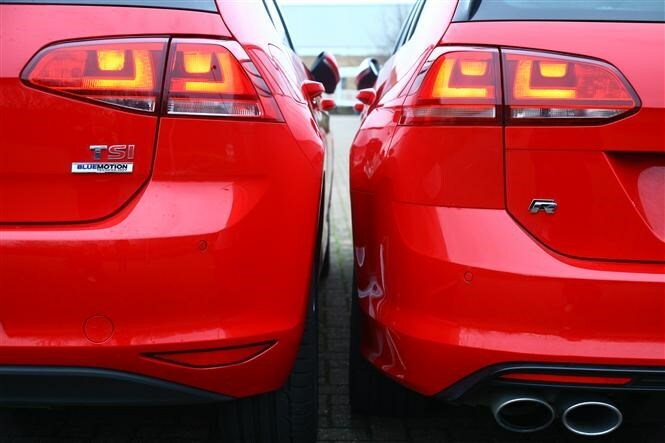 The R Estate represents a huge amount of talent, but it’s a lot more money than our 1.4 GT. If both sound tempting then we reckon it’s worth meeting somewhere near the middle, so if you can stomach diesel power, take a look at the Golf GTD Estate instead. A colleague told me recently he thinks it’s one of the most complete cars you can buy. 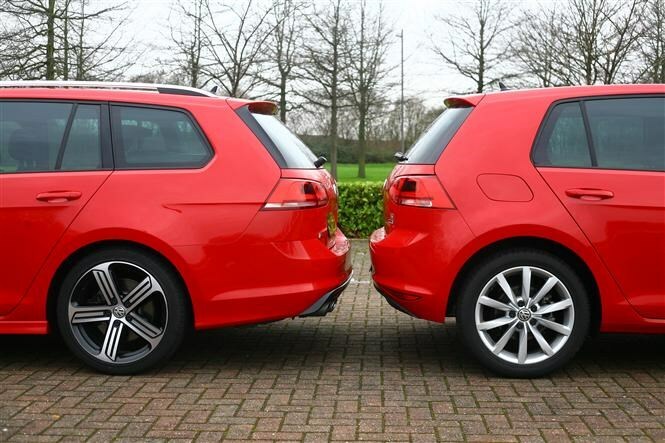 While it’s not the biggest car in the world, parking is surprisingly easy in our VW Golf. 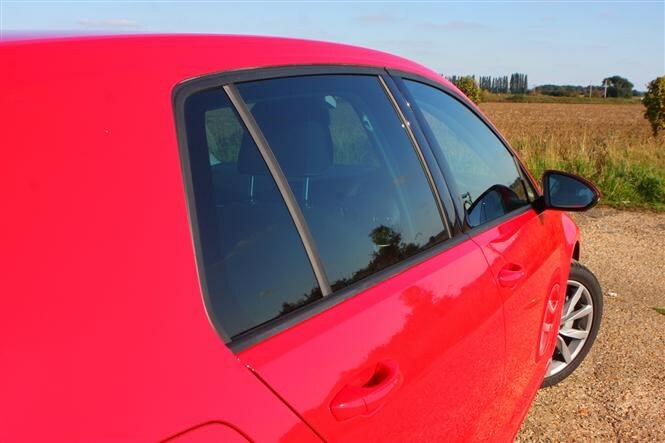 Not only does it have great visibility thanks to lots of glass and a decent driving position, but a number of parking aids are on hand to make life easier still. Take the proximity sensors, for example. They’re at both ends of the car and work by emitting an escalating beep as you get closer to an object, also displaying a graphic on the screen for a visual reference. But in my eyes the cleverest thing on the car is the reversing camera. Loads of cars have these, but not many have such a neat solution to keep it free from grime and hidden away when not in use. The touchscreen unit in the centre console then displays the image along with some guidelines to help you manoeuvre the car into a space. I’m a woeful parker (despite this publication’s name) so it’s great to have a little help to slot the Golf straight into a tight spot. 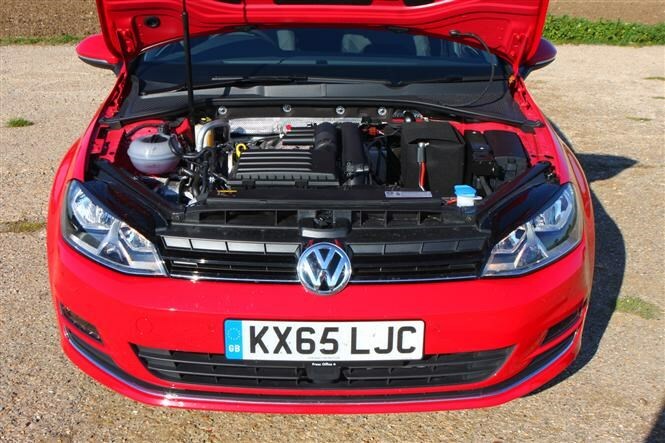 It’s been a challenge, but we’ve finally completed the run-in period so we’re free to open up the 1.4-litre TSI petrol engine installed in our long-term VW Golf GT. With 150hp and 250Nm, its performance isn’t quite hot-hatch territory, but it’ll still cover 0-62mph in 7.9 seconds and hit a top speed of 134mph. It’s a relaxing drive, too, without the frantic wheelspin associated with more powerful turbocharged cars. The power builds in an almost linear fashion with no drama, and crisp throttle response helps it to deliver a far more rewarding drive than you’d get from a diesel. I’m glad it’s a manual gearbox, too. The six-speed’s shift-action is reassuringly solid in a world where many are moving to automatics. 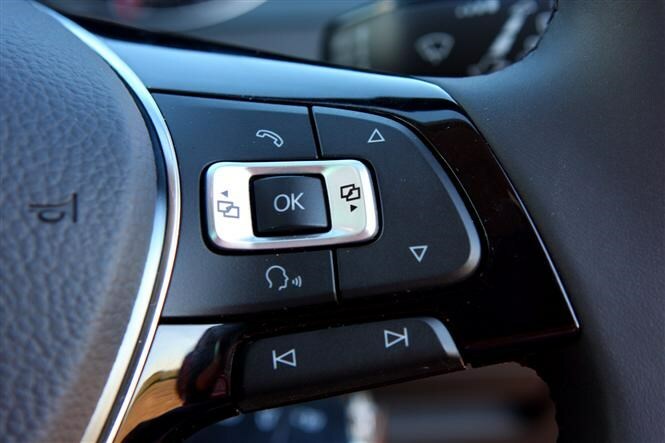 I was surprised to find that the adaptive cruise control system keeps working when you change gears too, so you can literally pull up to a junction or roundabout without having to use the throttle or brake at all - as long as there’s a car in front of you doing the required speed for the manoeuvre. I’m using cruise control a lot in this car now. It’s yet another thing which makes the drive a little more relaxing. It’s been fascinating to feel the Active Cylinder Technology (ACT) working. Or more precisely, not feel, since it’s almost impossible to sense the transition to from four to two cylinders and back again. There’s a little icon on the dash saying ‘eco’ which flashes up so you know when only half the engine is working – thus saving fuel – as you can see in the picture below. Of course, the entire point of the ACT system (also known as Cylinder on Demand, or CoD) is to save fuel. I’m keeping a close eye on my economy calculations to see how the Golf is faring, and at the moment as the miles pile on, it’s creeping towards a calculated 44mpg average during real-world driving. Not bad for a petrol-powered car – especially considering the claimed economy is 57mpg. I’m thrilled to report the clock has finally ticked over the 1,000-mile mark in our new Golf, so it’s time to realise this clever engine’s full potential. The time spent unable to explore the full breadth of its power and torque range has allowed me to discover some of its less obvious attributes. I was pleased when the cable for my Smartphone arrived, allowing me to charge my phone while I’m playing an audiobook or streaming an album. It complements the car’s so-far impressive multimedia system – though I’ve yet to get my head around the voice control system. My colleague Graeme borrowed the car for some of the running-in period too, and returned the keys along with words of praise for the popular Volkswagen. Unfortunately along his travels he also picked up a small stonechip in the windscreen. It’s not a game-changing bit of damage by any stretch – it’s smaller than a centimetre in diameter and not expanding – but will need to be filled soon because it’s in my eye-line so a fraction distracting. 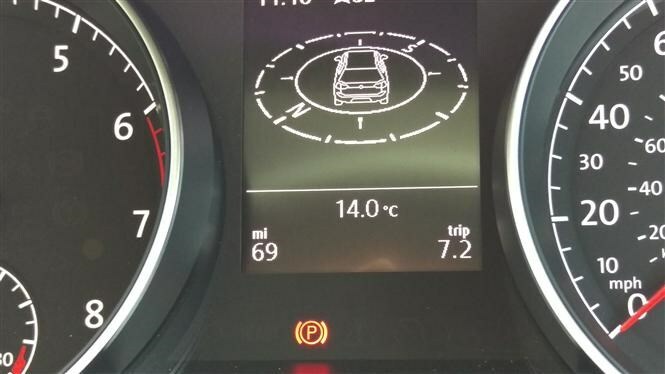 While I appreciate we’ve been treating the Golf with kid-gloves since we took delivery, it’s been heartening to see the trip computer regularly claiming over 45mpg. A calculation of miles covered vs fuel used on every tank confirms that it’s not dipped under 40.8mpg for the entire time. As there’s a general trend towards improvement as the engine beds itself in, I expect more to come too. Whether it’ll approach the heady 57mpg that VW claims is possible is another question altogether of course. I have to admit though, once the 1,000-mile threshold had passed, the first thing I did was leave it in second gear and hit the accelerator as hard as I could. High fuel economy is great, but I’m a keen driver too and it’s looking like this 1.4 TFSI is an absolute corker of an engine in that respect too. I collected our shiny new Volkswagen Golf direct from the firm’s headquarters in Milton Keynes, immediately embarking on the first thing you have to do whenever you pick up a new car: running in the engine. Many people these days simply don’t know you have to do this, and in their defence, it’s not exactly obvious. I spotted a page in the manual explaining what needed to occur, though, as you can see below. It states a running-in period of 1,500km. I decided that since my colleagues would be driving the car too, I’d set a 1,000-mile threshold. The manual asks for engine speeds to be ramped-up carefully, but for simplicity between the team we agreed no-one would take the Golf’s new 1.4-litre TFSI petrol engine above 3,000rpm until it clicked over that magic number of miles. 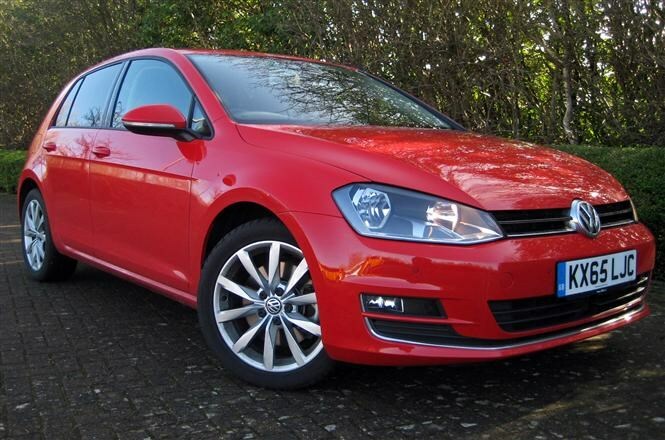 This gave me a good chance to get acquainted with the Golf at slower speeds, but first to form some initial opinions. What immediately hit me was just how comfortable it was with the upgraded seats you get on GT specification cars. They’re beautifully bolstered and seem to fit perfectly to my back. It’s such a simple thing that so many car firms get wrong, but not here. Then I switched it on, and was astonished by how quiet the petrol engine was. It’s a product both of the fact that they’re often much quieter than diesels, and that the cabin is so well insulated. That’s something VW intentionally does better than SEAT and Skoda – two other brands using exactly the same underpinnings for the Leon and Octavia respectively – and it’s also one reason why they’re a touch more expensive. In essence, the Golf feels like a quality product. I found pairing up my mobile to the infotainment system quick and easy, but was surprised to find no USB slot to plug it into. Instead there’s an odd-shaped socket which works only with VW-supplied leads, and the two cables in the car were both for Apple products. I’m an Android user, so I’ll need to source another solution to avoid my battery running down as I stream music or audiobooks on long journeys. Still, that’s a minor foible within an otherwise brilliant experience picking up the new Golf. In the next update I’ll go through my first driving impressions. I’m not going to beat around the bush here. I’m in the fortunate position of swapping one of the UK’s best-selling cars directly for another. Gone is the Ford Focus, and here I am introducing the venerable Volkswagen Golf onto the fleet. As comparative tests in our industry go, there aren’t many bigger than this. For added perspective I’ve also run a SEAT Leon Cupra, which while an unashamed hot-hatch, is actually based on the very same modular ‘MQB’ architecture as the seventh-generation Golf and so shares much of its tech. 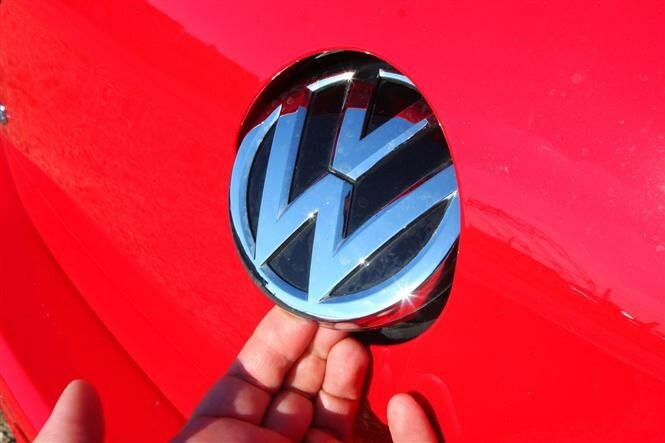 But before I take delivery of the new VW, let me take you through the specs. It’s in GT specification, which sits atop the Golf’s trim levels but below bespoke performance models such as the GTI, GTD and R. That means it gets loads of standard equipment (just like our Titanium X Focus) but there aren’t many optional extras installed. 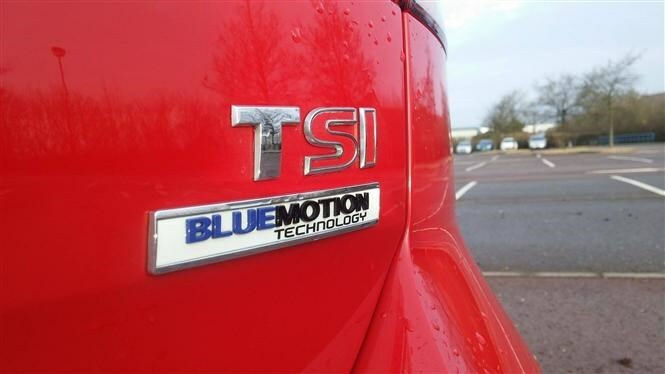 It also has the VW Group’s 1.4-litre TSI ACT engine, which means that it’s a turbocharged petrol four-cylinder with a clever system that shuts of cylinders two and three when they’re not required, apparently saving huge amounts of fuel. 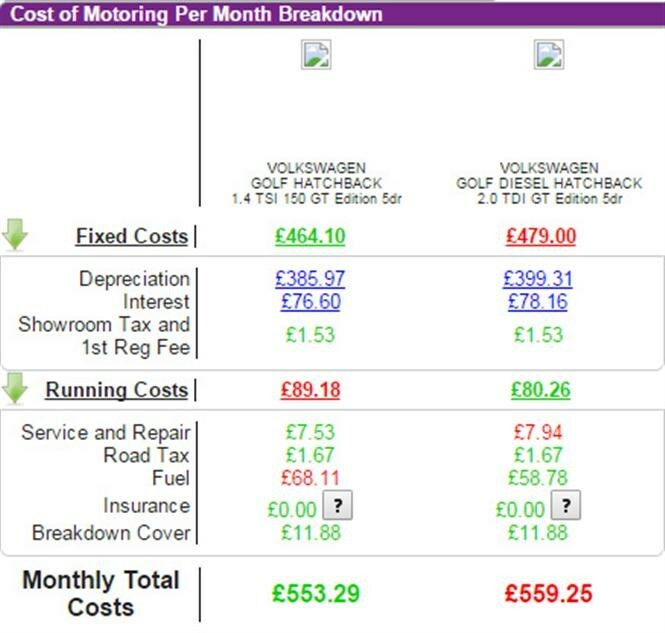 It’s going to be fascinating the compare the running costs with the diesel Focus in this sense. Conventional logic says the Ford should take the win, but I’ve a sneaking suspicion the Golf will edge out in front. 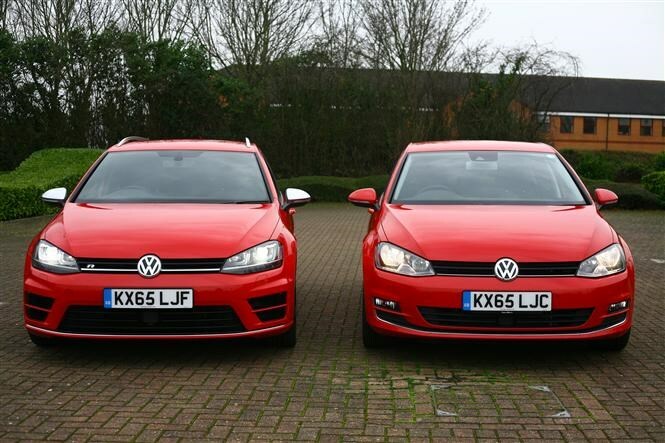 Another big difference between the two high-selling hatchbacks is in terms of comfort. I was really pleased with how the Focus was, but a glance at the Golf’s spec sheet reveals both special front seats and adaptive suspension featuring a ‘comfort’ mode. If the latest Passat (which features both too) is anything to go by, this is going to be one comfortable VW indeed. It also has something I felt sadly missing on the Focus: adaptive cruise control. This allows the car to travel at a set speed until it reaches a slower car, at which point it will decelerate and match the vehicle in front’s speed until they’re out of the way, at which point it speeds the car up again. Clever stuff; and from previous experience, incredibly useful indeed when it comes to heavy traffic or roadworks. It’s looking like it’ll be a very interesting six months with the most recent of the VW Golfs. Whether I like it as much - or more – than the Focus remains to be seen, but the Parkers team is going to enjoy finding out. 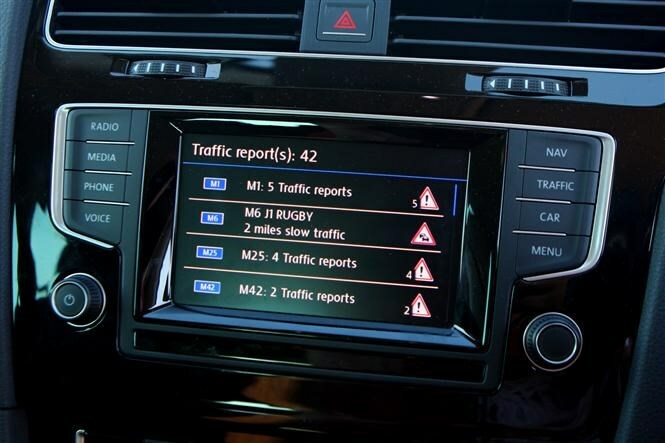 The Golf has proved to be an easy car to get on with in the Parkers team, but here’s a first world problem that’s continued to bug me from day one: mobile connectivity. Why VW decided to make its own universal port over the already-universal USB is beyond us. The Golf initially arrived without the required cables too, leaving us stuck with Bluetooth and the absence of keeping our phone / iPod charged in the process. 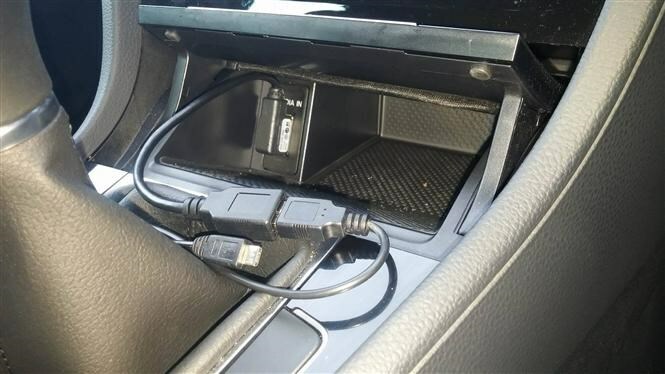 Sounds easy enough, but with the port located in the dash cubby hole with the release clip facing the wrong way, you’re usually spending the first part of your journey simultaneously cursing, ignoring suspect passers-by, and wondering if VW employees have tiny hands. You could simply leave the USB socket attachment permanently plugged in and bring your own cable, but that leaves you with a reel trailing around the gear lever.